Specific information relating to a LEED for Homes credit category or other rating system component. Avoid these errors to make sure you ace your final inspection but also these are just great all around tips for Green Building. LEED or not. “You lose the benefit if you’re just doing it for the paperwork,” Foss said. If you have questions, simply ask your rater—they’ve been through the LEED process before. “It’s better to ask questions before ordering the HVAC equipment,” she said. Some common calculation errors to avoid: Make sure you have the right city listed, that the home’s infiltration is rated as “tight,” and that the insulation values of the walls and windows are accurate. And don’t try to mislead your green rater—it’ll just add time and frustration to the certification process. 2. Duct Leakage. LEED for Homes requires certified projects to reduce duct leakage to 6%, so it’s important to pay attention to detail. Look for duct boots that aren’t sealed to the drywall and places where the top of the duct is not sealed. Make sure installers seal connections with tape or mastic adhesive in addition to using a mechanical fastener—a zip tie won’t seal. To avoid running into any problems, Foss suggested builders work with HVAC installers to make sure they know both how to properly install the equipment and how the testing will be performed. Seal the mechanical unit before it’s set in place, and test the system before close-in, especially if it’s the installer’s first time working on a LEED project. 3. Air Flow. Proper air flow around the home is important for even and efficient distribution of conditioned air, so these LEED credits help builders ensure their homes are comfortable throughout. Foss said one common problem is poor duct installation—kinked or sagging ducts, long runs, or too many bends. Another is missing air flow return pathways in the bedrooms. Foss suggested some fixes to avoid any issues during certification. First, use the duct design. Ducts are a commonly changed site-built item, but following a plan can avoid errors. Second, discuss what type of start-up the HVAC contractor will perform and how they’ll be on the hook for the design they gave you. Third, install dedicated return jumper ducts or transfer grilles in rooms with a door. Using the Energy Star Version 3 HVAC installer checklist and companion guidebook can help ensure installation is completed properly. 4. Air Filters. Be ready for inspection by walking the site and looking for any of the original blue air filters that weren’t replaced with higher-MERV versions. Foss said green raters often see this issue as an indication the builder may have missed other details. “If the builder isn’t clear on it, how will the homeowner know?” she asked. 5. Bath and Kitchen Fan Exhaust. Foss said a common problem is that homes don’t meet the exhaust fan testing requirements of 50 CFM for bath fans and 100 CFM for kitchen fans. The most common reason is that the builder buys a bath fan with too low of a nominal rating. You can’t just buy a 50-CFM fan to meet the requirements, she said, because the rating doesn’t take into account the ducting or other obstacles. You’ll often need an 80- or 100-CFM bath fan to meet the testing requirements. A common issue in the kitchen is improper installation of the microwave, preventing the dampers from opening. Make sure different trades are communicating to double check that the fans work after installation. To diagnose potential problems, turn on the fans and listen. If it sounds wrong, Foss said, something is going on. Try the toilet paper test—the exhaust fan’s air flow should be able to hold up a square of it. And finally, double-check to make sure dampers aren’t painted shut at the exterior. 6. Ventilation and Exhaust Controls. LEED requires mechanical ventilation, and the homeowner must know how to use it. Some buyers have an expectation that today’s green homes can be completely run from a smart phone, so ask them about their expectations. Think about how they’ll be using the system. The right controls will be contingent on the ventilation strategy. Is it exhaust, supply, or balanced? Continuous or intermittent? Are other systems involved, such as the bath fan or air handler? For exhaust-only systems, a delay timer is helpful in the bathroom. And even if the bath fan is running continuously to meet ASHRAE requirements, you’ll probably need a boost switch to kick it into a higher mode after showers. If you’re using central ductwork with an energy recovery ventilator or heat recovery ventilator, make sure the ventilator interlocks with the air handler. 7. Air Sealing. Foss said the common issue she sees with air sealing is penetrations through the air barrier. “Make sure you think about what is the air barrier, and relay that to the trades so they know when they make penetrations,” she said. Decide who is responsible for penetrations. Will the plumber seal any holes he makes? Are you hiring an air sealing company? Also remember that spray foam is not a total air sealing package. You still need to seal between studs, for example. In multifamily projects, make sure there is no air movement between units, as well as between units and the hallway. Don’t assume fire stopping is the perfect air barrier. To avoid issues, include the air sealing details in your plans. Assign responsibility and train all crews. Do a mock-up unit that the green rater can pre-inspect—this is often used as a training opportunity for the crews. Finally, consider purchasing a blower door test for yourself, and start testing. 8. Insulation. There are a number of easy ways for builders to go wrong with these LEED credits: missed insulation in tricky areas, differing R-values, batts compressed at the corners, and missed bays that are hidden by other batts are all common problems. With spray foam insulation, look for even installation with no valleys in the middle. Measure the depth of the insulation while the truck is on site so subs don’t have to come back to correct any problems. Leave enough time before hanging the drywall to make corrections. 9. Project Team Communication. 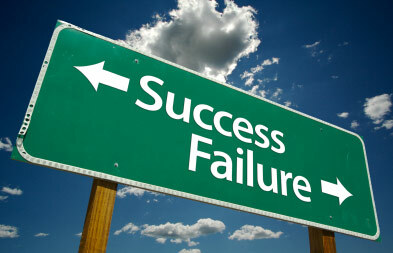 A common problem builders face, Foss said, is not updating project team members on any changes. On LEED homes, in particular, you need bottom-up understanding of what’s happening with the project. A change in one part of the house might affect the mechanical equipment selection, for example. Write the LEED requirements into your specifications and follow them, Foss suggested. Assign responsibilities down to the last half point. Also decide upfront who will pay for fixes or re-inspections to avoid being left on the hook for the cost of a contractor’s error. 10. Documents and Submittals. Some LEED points require documents and records, such as product details and waste. Include documentation requirements in subcontractors’ scope of work or contract. Tying those requirements to payment can be an effective way to ensure the requirements are met, Foss said. Presenting at an educational session at the recent Greenbuild Conference, Foss, managing partner of Washington, D.C.-based green building consulting company Everyday Green, recounted the inspiration for her presentation. Jeffrey Lee is Managing Editor of EcoHome. Raymar Homes has completed and certified a LEED Gold House in Rockford, Michigan. This video displays visuals of how many points were achieved. Credits appear on the screen that correspond with visual measures of LEED points. USGBC has created an online tool that will allow anyone to “kick the tires” on taking a single- or multi-family building through LEED for Homes certification. 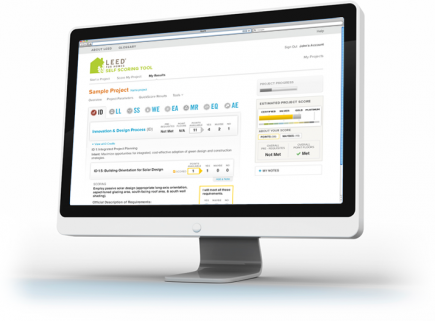 The Online Scoring Tool (OST) is available at no cost through www.leedforhomes.org and provides a great way to evaluate the LEED rating system. The user-friendly Online Scoring Tool (OST) allows free access to anyone that creates a web site account. Once logged in, people can score multiple rojects using the online scoring tool. Projects can choose to take one of two paths with the LEED Homes scoring tool. One path called the Quick Score, allows a builder to answer a green home version of 20 questions about a sample project. Its perfect for a builder that has had a HERS Rating performed on a previous home and is wondering how that home would have scored in LEED. Once the questions are answered, the scoring tool gives an estimate on the potential LEED certification level. A more advanced path allows the user to go through the LEED for Homes rating system in detail for a specific project, with credit-by-credit analysis. Each credit can be selected as Yes, No, or Maybe. Best of all, the online tool does an impressive job of digesting the extensive LEED for Homes Reference Guide into salient tool-tip help that can be brought up in a popup window. This explanation will help people decide whether or not they want to pursue a specific LEED credit or not. 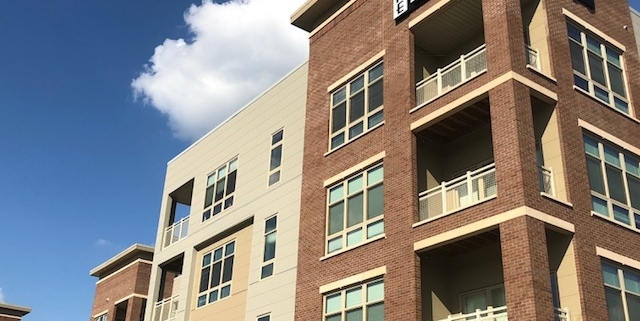 is conducting a post occupancy utility study of all our current/future LEED for Homes projects in conjunction with USGBC’s new pre-approved Building Performance Partnership ID credit. This study will help measure the effectiveness of LEED™ for Homes, work as an educational tool and help promote the LEED™ standard and all parties involved in certified projects. We encourage project team leaders to inform residents of this opportunity. Project teams signing up can earn one Innovation and Design point for enrolling. Background Information USGBC’s Building Performance Partnership (BPP): engages commercial and residential LEED building owners and managers in an effort to optimize the performance of buildings through data collection, analysis and action. This partnership among USGBC and the thousands of LEED project owners will result in the population of a comprehensive green building performance database, enable standardization of reporting metrics and analytics, and establish new performance benchmarks. USGBC’s BPP participants are eligible for annual performance reports, report cards and real-time data interfaces to aid in their building performance goals. Together, USGBC and BPP participants will transform the way the world views building operations. Let us know once you have signed up! The first public comment period is open for LEED for Homes changes that will go into effect in 2012. The comment period closes at the end of this year – Jan 14, 2011. You can download the full version at but as a LEED for Homes Provider, has distilled some of the highlights for you. 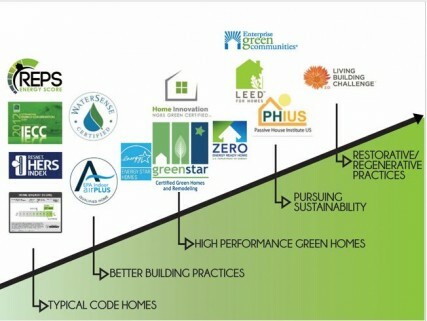 This information comes from the LEED for Homes Specialty Update given Nov. 19 at Greenbuild 2010. LEED has had its share of detractors lately whether it be concerns over post-occupancy performance, alignment with ENERGY STAR version 3, collaboration with Passive House, or the impact of green buildings on human health. There are many voices that have talked about ways to improve the LEED for Homes rating system. Now, those looking to shape the future of green building have through the end of the year to make their voices heard. All versions of LEED, including LEED for Homes, will be finalized in 2011, due to launch in just over a year at the beginning of 2012.